Leonardo da Vinci used to say that paintings are easier to appreciate than poetry because one can notice paintings’ beauty at a glance while poetry transpires its value only after reading several lines. But reality showed how mistaken he was! Disproving the idea of the 15th-century genius took a few hundred years and required using an advance technology to discover the amazing truth about our eye movements. 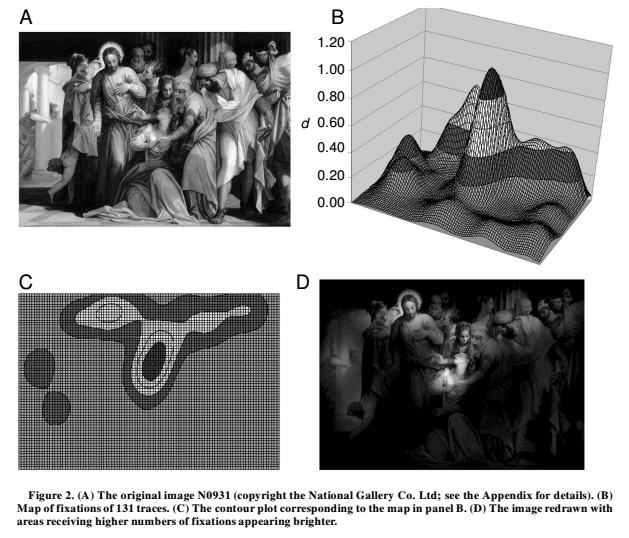 The largest eye tracking study in the world conducted in the National Gallery showed that paintings are perceived by the viewers similarly to e.g. poems. Our sight does not embrace the entire painting at once, it focuses on chosen fragments which are the size of a…fingernail. Only after jumping around from one detail to another our brain starts shaping the general picture. This discovery partly explains why sometimes you need to stare at a given artwork for many hours in order to notice more details which were invisible “at first sight”. Human eyesight turned out to be similar to the one of a magpie – it’s drawn by vivid colours and unique textures. The most intriguing elements for human sight are faces, especially eyes and lips. At the same time the most uninteresting element is the sky. The results of the study disproved the assumption of several artists who claimed that creating a given perspective in a painting will make the audience more interested in this particular work of art. As it turned out the perspective doesn’t determine the way we look at paintings. But how exactly was Da Vinci’s theory scientifically challenged? It happened during a 3-month study conducted by researchers from the Applied Vision Research Centre of the Derby University. 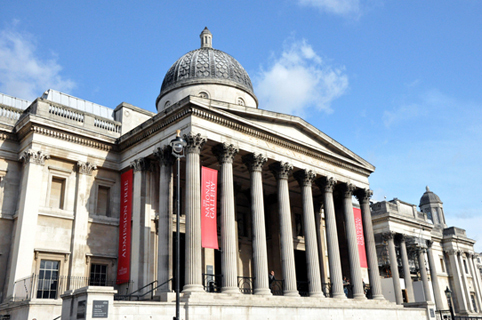 They decided to organize the first eye tracking experiment on such scale and the London-based National Gallery was the perfect venue for the study, The time and space chosen for the experiment were not coincidental – it was conducted during the “Telling Time” exhibition which was one of the national millennium celebrations on the turn on 2000 and 2001. The exhibition was related to the concept of time in art and researchers from Derby University agreed that their experiment would fit perfectly into this landscape as a symbol of modernity. In 3 months the exhibition was visited by 120 000 viewers, almost 10 000 of which took part in the study. The researchers gathered full results of over 5 000 participants, mostly between 15-34 years old. 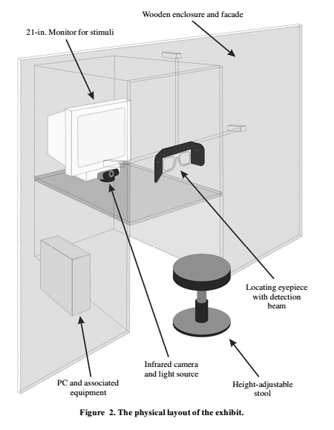 The study was proudly announced as the first in history to use eye tracking equipment. It took place in a separate room of the museum where one of three paintings were displayed to visitors for 20 seconds. During this time the eye tracking device registered eye movements of participants comparing the eye movements to the displayed painting. The most surprising discovery for many participants was finding out they don’t control their eye movements. Very often participants were certain they were looking at a given point while in reality they focused on a completely different area. Preparations for the study were quite challenging. The British research team wanted the exhibition to be intuitive and friendly and eye tracking itself to be discrete. First of all, they didn’t want users to feel uncomfortable while gazing at a painting – many viewers are embarrassed if they know they are recorded and this could distort the results of the study. There were also some technical constraints. Recording equipment had to be installed at a hight of around 1,2m so that shorter and disabled viewers could also fit in the range. The largest obstacle turned out to be glasses which made it impossible to track eye movements correctly. As a result, most viewers who were able to participate in the experiment were quite young. The main aim of the study was to check how we look at paintings. But the amazing amount of data that was gathered during the study was used in a variety of ways. We hope that results of the study would be used to analyse how we look at any images – from road signs to X-ray images, which in the long run would be beneficial to the whole community – said Alexander Sturgis, curator of the exhibition. He also highlighted the benefits of the fact that both men and women took part in the study – Because the gender ratio of participants of the study is almost equal it will be possible to conduct the gender analysis of perception – what draws men’s and women’s attention. Even though the study was conducted 15 years ago it’s still inspiring for researchers all over the world. The eye tracker is currently gaining more and more popularity among UX specialists. Let’s hope that the use of this device in UX studies will be as fruitful as the British experiment.